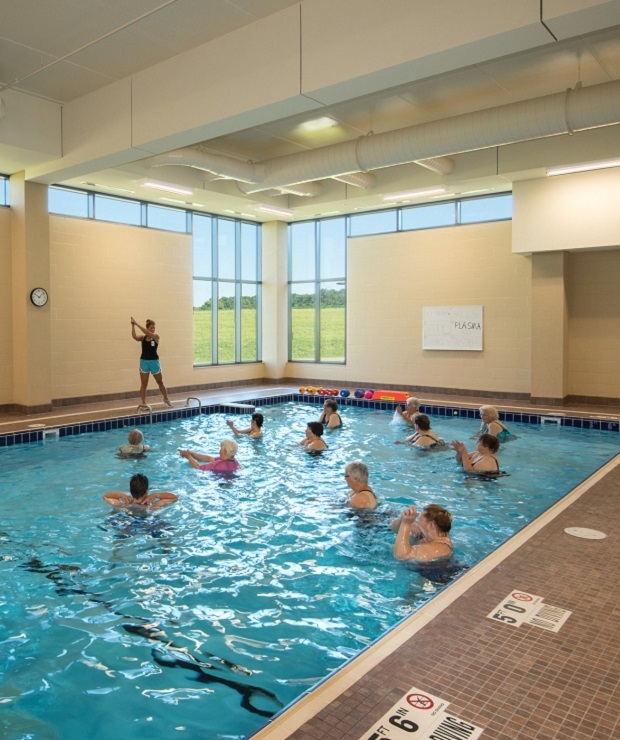 Western Wisconsin Health's warm water pool offers a unique exercise opportunity for area residents. Water’s healing properties improve muscle strength, endurance and flexibility with minimal impact on joints. Exercising in the pool improves balance, coordination and cardio respiratory fitness while decreasing pain and stiffness. The Therapeutic Pool will be closed the week of March 4-9 for annual pool cleaning. 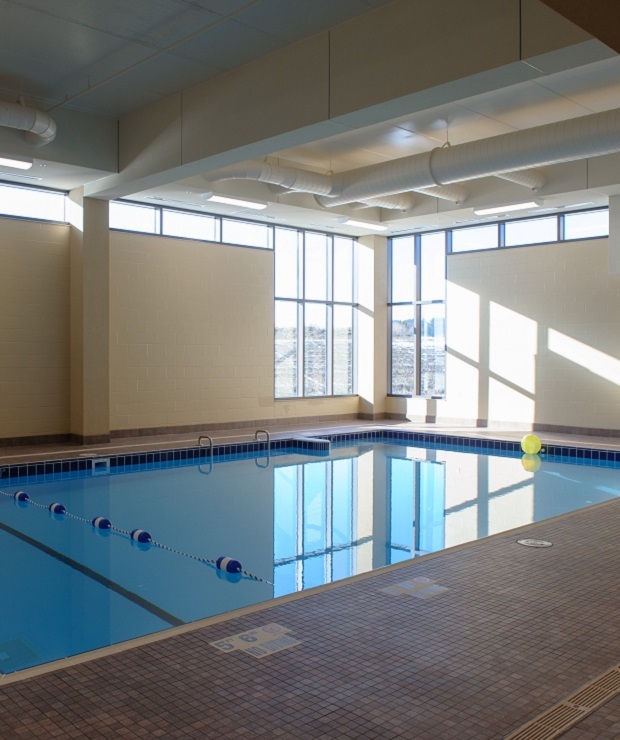 The pool will re-open as scheduled on Monday, March 11, 2019. Thank you! Age 16 and above may utilize the space without any restrictions during open pool hours. Age 12-15 must be accompanied by a Parent/Guardian who is a Member during open hours only. This option allows you to pay automatically from a checking or savings account on the 15th of each month. This option allows you to pay for the entire year in one installment. If you have Blue Cross – Blue Shield of Minnesota, Medica, Health Partners, or UCare you may be eligible to receive a $20.00 reimbursement each month. We also accept Silver & Fit. Please present your health insurance card for confirmation. Western Wisconsin Health offers swimming lessons for toddler, preschool, and school age beginners. Lessons are available Tuesday and Thursday evenings, as well as Saturday mornings. Goals are to learn to ask permission when entering/exiting the water and how to perform safely as well as increasing comfort level in the water. Builds on Level 1 skills and begins to address comfort with movements that are a precursor for stroke development. Enter independently, travel 5 yds, submerge mouth and blow bubbles for 3 seconds, and safely exit the water. All skills can be performed with support. Front glide 2 body lengths, roll to back, float 5 sec, recover to standing. Back glide 2 body lengths, roll to front, float 5 sec, recover to standing. Swim using arms and legs on front 3 body lengths, roll to back, float 5 sec, roll to front and continue swimming on front 3 body lengths. Step from side to chest deep water, move to front float for 5 sec, move to back, float for 5 sec, return to standing. Move to back float for 5 sec, roll to front and recover to standing. Push off and swim using arms and legs on front for 5 body lengths, roll to back, float for 5 sec, return to standing. Move to back float for 5 sec., roll to front and continue swimming for 5 body lengths. This level is for children 5 and older who are beginning lessons. The skills learned are similar to a combination of those in Preschool levels 1 and 2; however the style of teaching will be more directed toward the learning capabilities of an older child. This level is intended for children who have either completed LTS 1 or Preschool levels 1 and 2 and have now reached school age. The exit requirements for this level are similar to that in Preschool 3. As with LTS 1, the primary difference in classes is the age and applicable learning style of the child. Cost: $50.00 (8 sessions) 25% discount for each additional child. Cash, check, or credit cards are accepted. Checks should be payable to Western Wisconsin Health. Payment is due upon registration. Prior to class, please complete the Swimming Lesson Registration Form. Return this completed form with payment to the Western Wisconsin Health Fitness Center to secure class registration. For more information or to register, please call 715-684-1642 from 7:00 – 11:00 am or 3:00 – 7:00 pm or e-mail emily.labadie@wwhealth.org. Private swimming lessons are available upon request. The purpose of this class is to allow women who are pregnant to exercise while enjoying the added benefits of what a therapeutic aquatic environment can provide. Classes are designed to incorporate a combination of gentle stretching, aerobic exercise and strength training tailored to the needs of expectant mothers. This class is open to mothers in any stage of pregnancy. Permission from your healthcare provider is required. The therapeutic pool at Western Wisconsin Health is heated to 89° and the surrounding air temperature is 92°. The depth of the pool is 3’8, increasing to 4’8. In addition, the pool has a bench along two sides for seated exercises and stretching. Continuing to exercise throughout pregnancy will help maintain cardiovascular fitness, combat fatigue and aid in adapting to the continual changes that occur during the months of pregnancy and beyond. It can also assist with relaxation/stress management and provides an environment in which to meet others in the same stage of life. • The pressure of the water can help decrease edema. • The buoyancy of water decreases the effects of gravity. pregnancy, particularly in the lower back. • It allows the opportunity for exercise without the higher impact which needs to be avoided, especially towards the end of pregnancy. • Certain positions such as lying on your back should be avoided or can cause discomfort, but being in the water allows the mom-to-be a little more freedom in her exercise routine. Relieving this discomfort on a regular basis can help to keep pain under control and prevent muscles from becoming progressively tighter. Prenatal Aquatics classes are available by appointment only. Please call 715-684-1646 for details and to register. Prenatal Aquatics Participation Waiver must be completed by your medical provider prior to participation. Click here for a printable version of the waiver. A supporting warm-water exercise program to ease joint discomforts, muscle aches and pains. This class is offered on an ongoing basis and is free for therapeutic pool members. The non-member drop-in rate is $7.00 per day. An energizing, fun and effective way to burn calories and tone muscles. This class will offer an interval workout while moving through a variety of stations giving you a total-body workout followed by a 15-minute stretch and cool down. Open to all levels of fitness and swimming experience. Aqua Circuit is offered in 8-week sessions and costs $50 for members, $75 for non-members, $10 drop-in for both members and non-members. Space is limited. Please call 715-684-1642 to register. Incorporating concepts of Tai Chi and Qigong, you are guided through a series of relaxation movements using a combination of deep breathing and slow broad movements of the arms, legs and torso. Enhance your range of motion, balance and mobility through Ai Chi. Ai Chi is offered in 8-week sessions and the cost is $25 for members; $37.50 for non-members. $10 drop-in for both members and non-members. Space is limited. Please call 715-684-1642 to register. A water exercise program designed to increase flexibility, range-of-motion, cardio endurance, and overall physical condition. Beginning the class with gentle warm-ups and concluding with relaxing cool-downs for a complete full body workout. Aquacise is offered in 8-week sessions and the cost is $25 for members; $37.50 for non-members. $10 drop-in for both members and non-members. Space is limited. Please call 715-684-1642 to register. Registration and liability materials will need to be completed and signed before participating. Please visit our events calendar for more details on class offering dates and times. The new therapeutic pool has many features to make working out easy. A private assisted changing room is available for those in need of dressing assistance with a caregiver such as those with special needs and families with young children. The Hoyer lift assists those who are unable to use the stairs to get in and out of the water. A depth of 5’6″ allows more participants to achieve full non-weight bearing status. Two propulsion jets can be used for resisted swimming and water running. The pool floor is cushioned, decreasing impact on joints and protecting the fragile skin of our diabetic and older clientele. We provide lockers for all our members. Because the number of lockers are limited, they are available on a per visit basis only. Showers are provided to all members. You don’t have to carry that wet towel around in your gym bag. Towels are available to members of the pool and fitness center.